After payroll has been processed by ASAP staff, you can easily print checks in your office by following these steps. Select only the items you wish to print. By default, Reports, Invoices, Payroll checks and Misc Checks will all be checked. 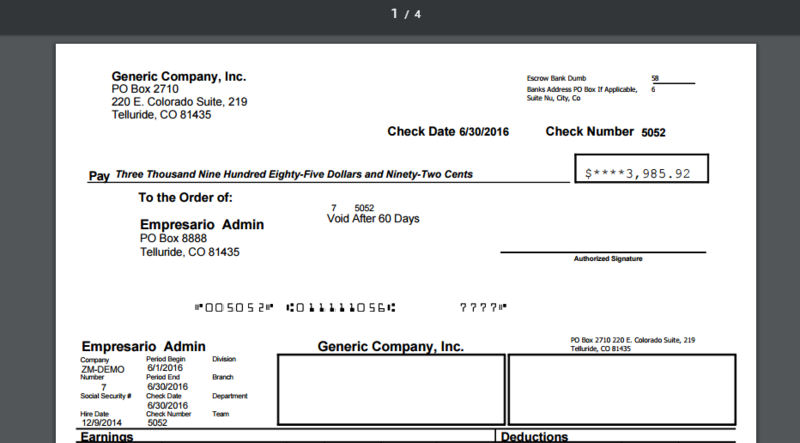 If you don't want to print Reports and invoices, just click to de-select. You will receive a confirmation of task added to queue, click OK. Your tasked item should be at the top of the queued results: it will take a few moments to finish, plus a few moments to load the image file once the task is selected. Once complete select "download" to download a PDF file which you can then send to your printer. Find the downloaded file either where you selected to save it or from the downloads menu of your browser. Open the PDF and print using the print icon. To return to the Evolution payroll app, click the Hide button on top right to minimize the task queue.